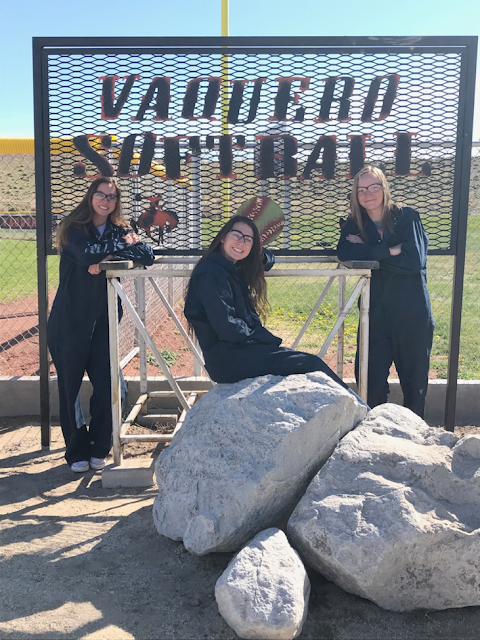 Natalie Stewart, Kody Arnold and Colby Johnson - students at Fernley High School - completed this sign to display next to the Lady Vaqueros softball field at FHS! The students are a part of Junie Estrada's Welding Technology Class. Shout out to DHS student Anthony Olivia who has won the gold medal for technical drafting at the SkillsUSA state championships. He will be given the opportunity to compete at the national level in June. Only first place qualifies for national competition! Congratulations, Anthony! FHS Band & Choir Spring Break Adventures! The Band lead off the Disney Soundsational Parade and the Choirs sang at the Hollywood Theatre in California Adventure. Both groups had to audition and were selected for live performances. 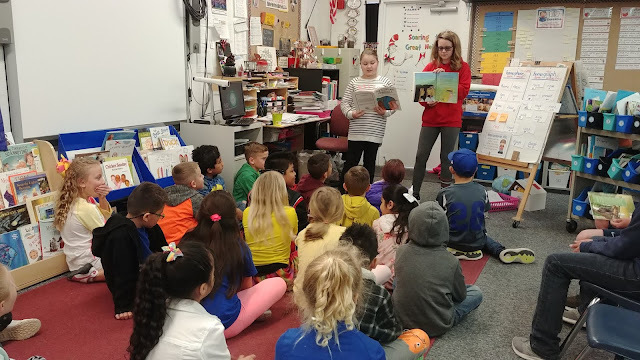 Fernley Intermediate School Falcon Leadership visited Cottonwood Elementary School during Read Across America Month. All the leadership students enjoyed sharing their joy for reading and being welcomed with open arms. Leadership readers especially liked the questions, feedback and hugs. The Succeeding Soarers donate socks to F.I.S.H. 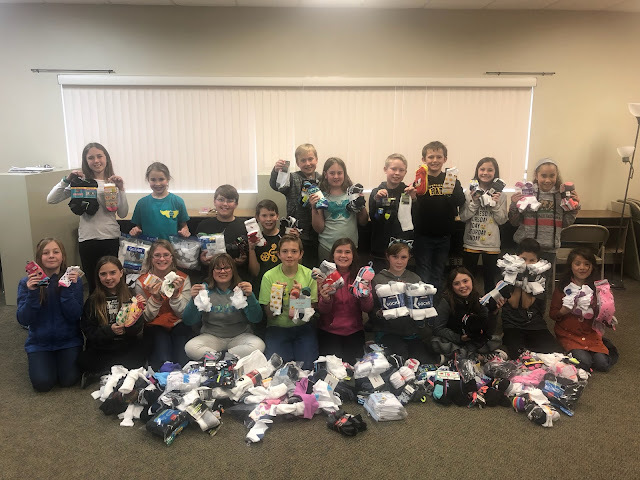 Riverview Elementary School student leadership group “The Succeeding Soarers,” decided to hold a Spring Donation Drive to help with the number one requested but least donated item for people in need: socks. During the month of March, the RES community donated almost 1,100 new pairs of socks for infants, children, men and women. On March 28th, RES student leadership traveled to the F.I.S.H. (Friends In Service Helping) Resource Center in Carson City and were able to hand out over 200 new pairs of socks to those in need. The students were able to meet with Alivia Flewellen, F.I.S.H. Client Services Manager, learned about the services they provide and received a tour of their food bank. Congratulations to Morgan Bumgardner from Dayton Intermediate School. Morgan represented Lyon County School District for the 8th grade at the State Spelling Bee on March 15th down in Las Vegas. 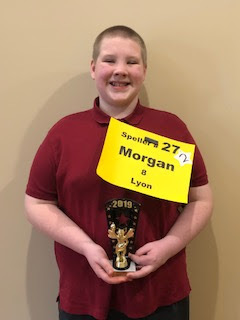 Morgan earned 5th place at State which qualified him for an invitation to the National Scripps Spelling Bee in National Harbor, Maryland to be held from May 26th to May 30th. Good luck, Morgan! P.S. Morgan is Julie and Will Bumgardner's son - congratulations Bumgardners! 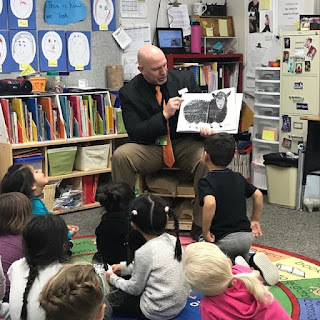 Reading week at Fernley Elementary was March 25th-29th and these students loved having District leadership read to them! Dayton High Students at NV Thespian Conference! 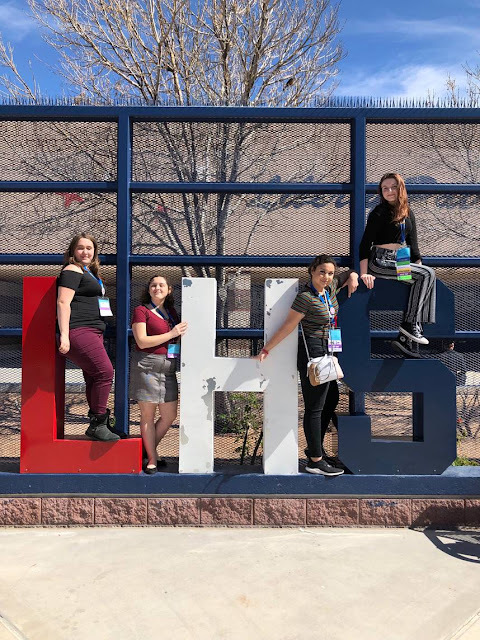 Five DHS students attended the Nevada State Thespian Conference and Theatre Festival at Liberty High School in Las Vegas. It was a wonderful weekend filled with competition, camaraderie and wonderful workshops, along with a fantastic student production of Legally Blonde the Musical! Three of the DHS students scored excellent ratings on their Individual Events and the two DHS students who were running for STO (Student Thespian Officers) made it onto the State Board! Sixteen students from across the state were in the running and they only chose 11. Our two students, Emma Cowee and Tyler Dickey, have the honors of being both the first STOs from Dayton High School, and Dayton is the only school where both STO candidates were chosen. There were 29 FFA chapters and 586 FFA students that competed at the Nevada State FFA Convention! The floral team ended up 5th in the state and Bailey Qualls was 8th high individual. The veterinary medicine team ended up 3rd in the state. Emmanuel Lopez 3rd high individual and Riley Urton was 4th high individual. The ag sales team got 2nd in the state. Melissa Lackore was 3rd high individual, Riley Urton was 4th high individual and Dylan Thran was 7th high individual. The Horse Evaluation team ended up 2nd in the state. Emmanuel Lopez was 4th high individual and Aspen Wright was 8th high individual. Riley Urton also received her State FFA Degree. 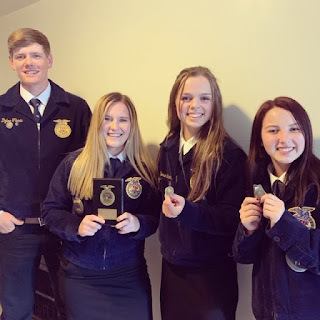 The students participated in various Career Development Events and Leadership Development Events including, Floriculture, Agriculture Sales, Vet Medicine, Horse Judging and Poultry Judging. A big round of applause for YHS's very own Tamra Herschbach! 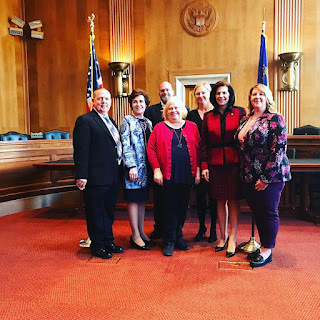 Tamra Herschbach recently won the Nevada State Agriculture Teacher of the Year and is also a National Fellow for the Association for Career and Technical Education. She just recently returned from Washington, DC where she was lobbying for Career and Technical Education and speaking with Congress folks from our state. She attended the National Policy Seminar and advocated for Career and Technical Education. She was able to meet with all of Nevada's Senators and Representatives, among others. She is a part of the National Fellowship of ACTE 2019 Cohort where she is 1 out of 16 individuals chosen for this leadership opportunity. It is a year long cohort, where she will be presenting at the National ACTE conference and be involved in year-long collaborations through conference calls, book studies and various written assignments. 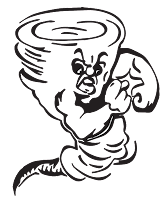 YHS student selected to NIAA/One Nevada top 10 Student-Athletes! Congratulations to Lindsay Mattice on her selection to the Nevada Interscholastic Activities Association (NIAA)/One Nevada Credit Union Top 10 Student-Athletes of the Year in Northern Nevada. On Tuesday, April 30th, Lindsay will attend an award's banquet at the Peppermill Resort in Reno. As an award recipient, she will receive a total of $1,000 (a $500 personal check from the NIAA and $500 check from One Nevada)! P.S. Lindsay is Duane and Crystal Mattice's daughter! Congrats Mattice family! FHS takes on Washington DC! 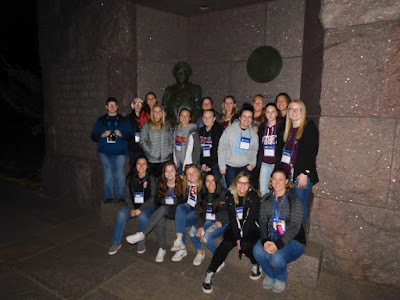 Mr. Cullar’s trip with FHS students to Washington DC and Gettysburg! 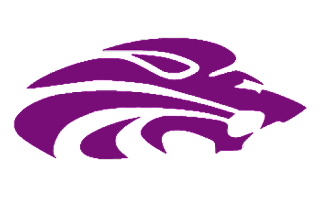 Earlier this school year, YES teacher Kerry Steven wrote a grant to provide a STEAM experience for the first and fourth grade classes at Yerington Elementary School. The artist-in-residence selected was Judith Dierkes. 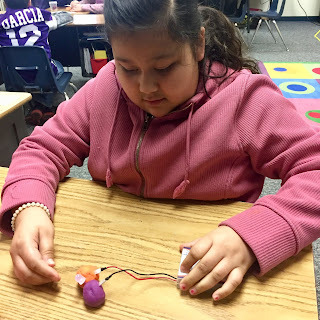 Her focus is bringing the arts into STEM education by using Squishy Circuits to incorporate LED light into the student’s artwork. She visited the school during the month of March. First grade students explored adding light waves to art by using LED lights in a dough sculpture. Fourth grade students learned about electrical current while making a sculpture that lit up using LEDs.